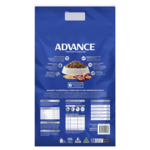 This super premium, Australian made, dry dog food is complete and balanced to support the health and wellbeing of your adult dog. 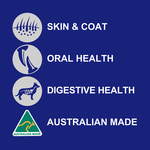 High quality Australian lamb is the first ingredient, and it contains beneficial nutrients including antioxidants to help strengthen the immune system, zinc and linoleic acid for healthy skin and a shiny coat, as well as prebiotic fibres to promote healthy bacteria in the gut for better digestive health and smaller, firmer stools. 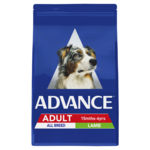 Advance Adult Dog Total Wellbeing contains controlled levels of minerals and is highly digestible to help reduce the risk of lower urinary tract disease, it is also specifically designed to help reduce dental tartar formation for better oral health. 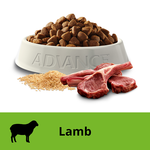 Lamb, Rice, Maize, Sorghum, Maize Gluten, Chicken, Chicken Fat, Natural Flavour (Chicken), Beet Pulp, Iodised Salt, Sunflower Oil, Potassium Chloride, Inulin, Choline Chloride, Taurine, Plant Extracts (Tomato Powder, Marigold Meal), Vitamin E, Turkey, Vitamin C, Zinc Sulphate, Citric Acid, Calcium Carbonate, Beta-Carotene, Antioxidants, Iron Sulphate, Copper Sulphate, Vitamin B5, Vitamin A, Vitamin B2, Vitamin B12, Potassium Iodide, Vitamin B1, Vitamin B3, Vitamin D3, Selenium, Vitamin B6,Vitamin B9. the kibble is quite large which is good for my dog who swallows his food. 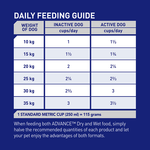 I LOVE how this keeps my dogs in tip top shape. Firm poo and glistening coats. Dogs absolutely love it. Aussie made as well which gives me peace of mind. 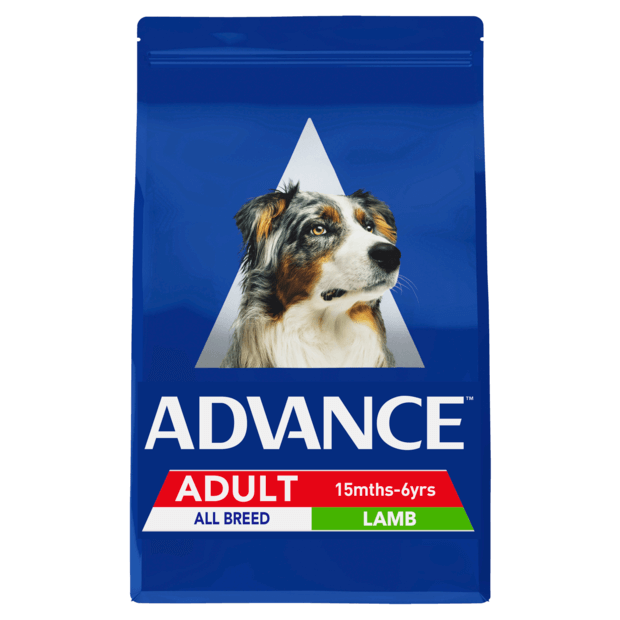 Love that I can purchase Australian made products and that Advance offer flavour variety for my dogs.